Occasionally, we love a change from our normal iyer food. 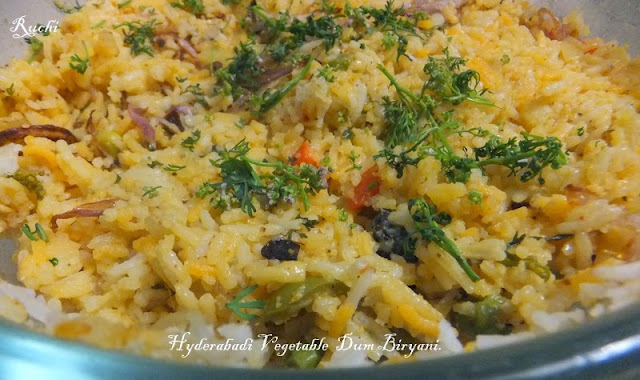 This week I prepared Hyderabadi Vegetable Dum Biryani for lunch. It is an amazingly flavorful main course rice dish.The blending of Mughlai and Andhra Pradesh cuisines in the kitchens of the Nizam, ruler of the historic Hyderabad State, resulted in the creation of Hyderabadi Biryani. An amazing flavorsome Hyderabadi vegetable biriyani based on basmati rice and a medley of mixed vegetables, yoghurt, golden fried onions, tomatoes ,nuts & spices and always slow cooked on dum. This cooking on dum gives the biryani its uniqueness and originality.I adapted this recipe from here. Instead of Garam masala I made home made Biriyani masala Powder.